So last Thursday I watched a Youtube stream of the unreleased first episode of The Legend of Korra, the sequel to Avatar: The Last Airbender. And, since we were at Gamestorm and all excited, I wrote a little one-page Apocalypse World hack for running it. 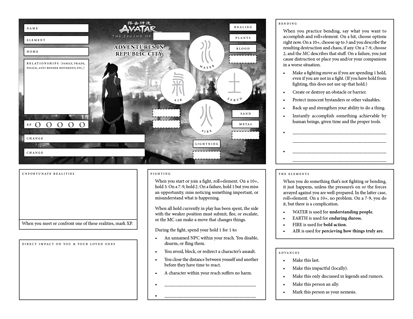 There’s a lot about this playtest draft that won’t be clear at all from just looking at it (it’s just a character sheet and most of the game only exists in my head), but I wanted to share anyway. I didn’t end up getting to playtest it or try some of the ideas out in practice, but hopefully soon. In any event, you can download the game here: The Legend of You. Lafferty met the Buddha of the Waste on the side of the blasted highway. Lafferty reached for his holster. “Me,” Lafferty chuckled. “Well, me and Charlene here,” he gestured to his signature shotgun (3-harm close loud). “Goodbye,” said Lafferty, pulling the trigger. But there was just a dull click; Charlene had jammed. Or else the bullets had gotten soaked through when he crossed that river of sewage a couple days back. Then the operator was on him, wrapping his cold hands around the Buddha’s throat and squeezing. But when it was over, Lafferty knelt next to the Buddha’s lifeless body, starring down at his own calloused, trembling fingers (1-harm hand), and he knew that the Buddha was correct. Apocalypse World is no place to raise children. Sometimes, though, a hardholder or scavenger brood makes a pact—with the blasted heath, with the poisoned ground, with the Psychic Maelstrom itself—and the pact is this: OBEY THE LAW AND YOU WILL SURVIVE. And so a haven is created amidst all the want and suffering, a hardhold of sorts but something more, something almost civilized. Children are born and raised within its limits, taught to fear the world beyond and to obey the law, taught the means of survival. Generations go by, and yet the people remain. But humanity is curious and heedless; they do not obey the law but break it—in part or in full—every day. And thus every day the broken world chips away at this mote of security and stability, awaiting the day when it will be consumed in desperation and darkness. The ones known as the Angel, the Battlebabe, and so on… maybe they were born and raised in a place such as this, a place long ago and far away, a place without the constant fear of death and want, a place long since consumed. If so, these are the stories they tell no one, the stories of what they used to be before the broken world made them hard, cool, hot, and weird, the stories of growing up. You can download it here. I haven’t playtested it yet (so take it for what it is) but I plan to do so at Gamestorm later this month, assuming I don’t get a chance earlier. It’ll definitely always be a hack that’s 2-4 playbooks long, at most, and will never turn into a big commercial hack (I just don’t see the need for it, honestly).